Would anyone know if the Yongzheng zhuanshu mark pictured was really created in this period? It differs a little from others of this period and I don't know whether there's sometimes a bit of variation in these marks eg it's missing the little "dot" in the top centre of the first character "Da". I guess I'm asking whether this fanghu is the real deal or a fake? Your comments are absolutely correct. I see there's a lot you can deduce from just looking closely at the object and thinking about every tiny aspect. In this case, the marks do have sharp edges, and the small character additions you would expect to see are missing, e.g. the small dot above the 1st character for "da". This suggests they were inscribed after firing. Thank you for your feedback & best regards. Marks are unreliable for authentication (see Marks) for various reasons. They can easily be and are actually faked. This said, I would not be able to tell if this item is from the Yongzheng period from these pictures alone. Would need to check weight, etc., and view the glaze and foot rim with a magnifier. Most of this type of items I have seen were from the late Qing dynasty. This one could be so too, judging by the foot rim. 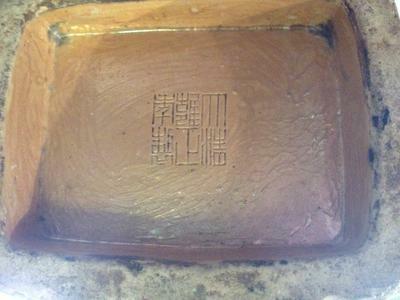 Further, most impressed or incised Yongzheng marks of the Zhuanshu type were four character marks, it seems. I would like to draw your attention to the fact that the bottom color was apparently added later (smeared on an unfired bottom?). It does not look like a fired glaze. And the characters are sharp and thin, which is not usually the case with marks impressed before firing. 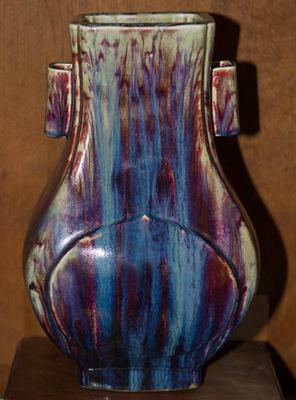 If a mark was to be added, it would logically have been impressed before firing, and a glaze would have been applied. Marks on unfired bottoms are relatively rare. Looks as if the mark was added later to lift the items perceived value. You might be able to see if the mark was inscribed later by looking for sharp edges along the character lines.